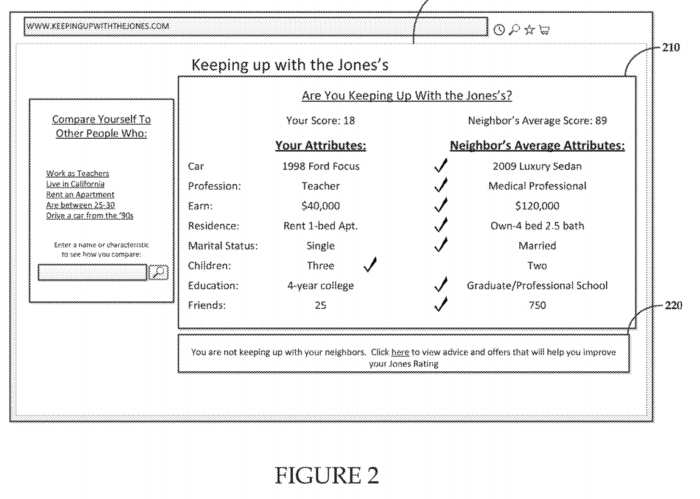 Mark Kapczynski’s new patent has the interesting title “Keeping Up with the Joneses.” U.S. Patent No. 10,019,508. It is basically a computers system that gamifies your life — comparing your life score to those of your neighbors, co-workers, or others. And, check out claim 1 that will fill several screens on your PC. This new patent is part of a family — see the parent U.S. Patent No. 9,576,030. The Examiner rejected the claims as being directed toward an abstract idea, but the applicant was able to argue around that rejection. communicate the updated website or mobile application content to the user computing device, wherein the updated website or mobile application content is renderable by the user computing device to display the updated user interface content. is certainly well known in the art of automobile comparison websites. you end up with a claim which would apply to dozen of different comparison websites. Given that the ordered combination of steps exists already for some data entities, shouldn’t it be considered obvious to apply them to a specific data entity? It seems like an obvious use of the existing ordered combination of steps. Presumably you cannot not claim using an existing milling process to grind a new species of wheat when the existing process is completely unchanged. Why would data in a computer be different? Of course the implementation of the comparison in code is different for every different kind of information, but I did not see any details claimed here. May be a good 103 argument can be presented. You seem to have a good start there. Oddly, one of the problems with information processing is that it had such a horrendous start with Benson. Benson’s rationale for trying to exclude information processing patents was that the PTO did not have enough prior art. This set up a really weird situation where the PTO has never really tried to set up a new structure for examining information processing patent applications. I don’t completely agree with your reasoning, but the reasoning of applying algorithms and having examiners examine based on algorithms is the right one. The reason the PTO never did this is Benson and the anti-patent judicial activists who have always promised that just around the corner all those applications will be ineligible. Anyway, there is a long story here. And the reason that an algorithm approach was not adopted was that Benson was saying that algorithms are pre se not eligible. You see? It is quite a mess and it is the result of the judicial activist that fabricated nonsense. Notice again that 1) we see personal assessments of the invention that are used as a basis for patentability. 2) the way the system is supposed to work is with no hindsight, prior art, and reasons to combine. Additionally, the way it works is that a person may invent something and they have to invest capital or get capital. The market then decides whether it is a good invention. The little wan kies that are trying to make-up for their lack of having accomplished anything in the real world should hold their tongues. Two points: 1) The foundation of innovation is that the innovator should decided what to make. They need to find capital and then the market decides if it was worthwhile. 2) A person’s assessment of how good the invention is should be a factor in patentability or eligibility. The human condition. The little wankies that have never done anything in their lives want to judge and control the do’ers. Always been that way. That is why our patent system was set up to try to prevent the little wankies from making their subjective little opinions determine the outcome of patentability. In other words, the claim is directed to obtaining information, comparing it, and then assigning *some value* to the comparison, even though its clear that some embodiments of that assignment have no bearing in reality at all. Having children is a competition! Didn’t you know this? Especially if you’re making those blond blue-eyed white children which is how you Make Merka Great Again in the Repu k k ke universe. I’ve already filed my application on keeping up with the Jetson’s, by the way. Earth-based tech is soooooo 2010. Remember when Trump said he invented the phrase “Priming the Pump”? He never made such a claim according to New History and “anon” is going to tattle on you for getting off topic. If you have to “worry” about me tattling on you, maybe you should not be posting at all. “Data structures” are not structures. And this claim is pure garbage. Collect data, generate more data from the collected data, compare it, communicate it. That’s junk. Details are irrelevant in the absence of any novel physical structure or a new transformation of matter. Did you miss the Supreme Court 9-0 decision (even with a broken scoreboard) that stated that Machine or Transformation was not a legal requirement? You seem to keep on trying to nullify that statement and pretend that the law is something that it is not (and you do not even bother to draw attention to anything actually being broken in your statement of what is not in fact necessary). Bilski said it wasn’t the sole legal test. But the Court confirmed that the test itself is useful and the lack of a machine or transformation provides an important clue to subject matter ineligibility. It could be the only clue in many many many instances! In which case you’re sc r e w ed. And that’s often been the case in reality (where you rarely venture, because you’re a know-nothing glibertarian t u r d brain). In short, the Bilski court was addressing a very specific question. I won. You lost. You only need to look at the subsequent decisions to understand that fact, Billy. And you’re going to keep l osing, by the way. Cuz that’s what l 0 sers like you do. Now go assault a woman and cry about it later like your buddy Brett who you refuse to criticize because you’re a mis 0gynist enabling pile of dog cr @p.
That is expressly not what Bilski said. (… cutting through your snowstorm and returning to my point about what you initially state as if THAT is a legal requirement — yes, the fact that it IS “just a clue” should clue you in, but obviously, you still want to prevaricate). Just like a giant bullet hole in a person’s head is a “just a clue” that the person was shot in the head with a gun. For a supposed attorney, you show an extreme difficulty in understanding when something is a legal requirement and when something is not a legal requirement. Given how very basic this capabilit is, one can — and should — consider that you are intentionally dissembling on this point. Transformation of matter? Where do you get that the transformation must be of matter? Where do you get that the transformation must be of matter? If your claim doesn’t recite a new physical structure in structural terms, and you are not transforming a composition of matter into some other composition, then what on earth is being transformed? The ether? Flogiston? Your moving a comma from one part of a sentence to another? Doing math on a number? … you have to try hard to be that wrong, Malcolm. This has to be the worst idea ever. Looks like assignee is affiliated with with the corporate equivalent of a sewage pit that is Experian. You shouldn’t impune sewer pits by equating them with Experian. I humbly apologize to all sewage pits everywhere for my insensitive remarks. Given that this (or any) “software” claim could be written out “long-hand” into an “objective physical structure” claim — such as, for example, the objective physical description of “hills and valleys” of an encoded disc — one wonders how many tens (or hundreds) of “fill[ed] __ screens on your PC” such an optional claim format would be.